DVD. Instructional/Guitar/DVD. Bluegrass. DVD. Homespun #DVDKAUSD21. Published by Homespun (HL.641678). Every bluegrass flatpicker wants to play faster while maintaining good tone and timing. Steve Kaufman's powerful advice and well-thought out exercises help get a player's mechanics working correctly. 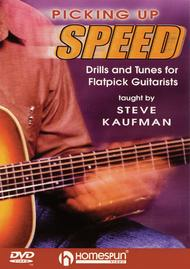 Using well-known fiddle tunes as drills, Steve works on coordination and how to practice for best results. 70-MIN. • INCLUDES MUSIC + TAB • LEVEL 3.